It started as sensitivity when you’d drink your morning coffee, but it went away quickly and on its own. Next, you noticed that while the sensitivity would linger, it still went away. Now, you’re awake halfway through the night with severe pain that even ibuprofen can’t touch. Your dentist informs you that you need a root canal. How did this happen? When a tooth sustains an injury, trauma, fracture or decay that has reached the nerve, an infection in your tooth may develop. 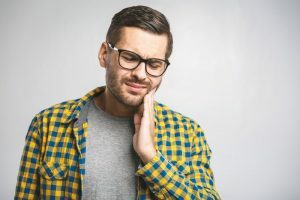 It is this infection that causes your pain and discomfort, and unfortunately, a dental infection won’t resolve itself without treatment, so don’t wait to contact your dentist. Some symptoms besides pain you may notice are swelling, discoloration or darkening of your tooth and sensitivity to temperature. What is the Process for Getting a Root Canal? During root canal therapy, your dentist will begin by using a local anesthetic to numb your tooth and the surrounding area; this will also relieve your discomfort. Next, they will remove the diseased tissue inside your tooth through a small access hole. Once the tooth is clean and infection-free, your dentist will seal your tooth with a temporary filling. When your tooth has had time to heal, you will return to your dentist’s office to have your tooth strengthened with a permanent filling or dental crown to ensure that it still provides all the functionality you had before your root canal. The cost of root canal therapy varies depending on which tooth needs treatment. For example, molars are more prominent teeth and have more roots than a canine, so the cost of treating a molar is more significant. Your dentist can help determine the exact cost of your treatment, and many dental insurances provide anywhere from 50% to 80% coverage for root canals. If you don’t have dental insurance, you can also talk with your dentist about convenient financing options that will allow you to break the cost of your treatment into affordable monthly payments. If you or a loved one is experiencing dental sensitivity, pain, or a toothache, don’t hesitate to contact your dentist right away for treatment. Dr. Sheri McIntosh leads the dedicated team of professionals at Distinguished Dental. We are always thinking of our patients’ best interests, and our focus is on making every experience exceptional for them. We strive to treat you and your family as we would our own family members, and patients appreciate our attention to detail and personalized care. If you would like to contact Distinguished Dental, Dr. McIntosh can be reached by calling 817-337-8300 or through our website.